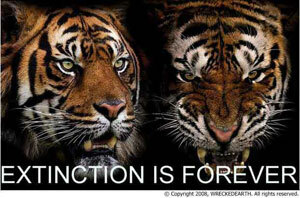 The tiger, the most iconic animal in the world, is also one of the most endangered. A cat of extraordinary beauty, strength, and majesty, the tiger is master of all and subject to none -- except the human predator. Of the eight original subspecies of tigers, three of the subspecies namely the Caspian, Bali and Javan tiger have already become extinct within the last 60 years; and a fourth sub species is facing imminent extinction with less than 50 South China tigers left on the planet - few, if any, survive in the wild. Tigers increasingly compete with expanding human populations and industry for land and food, and many are killed by poachers who sell their skins and body parts as ingredients for traditional Chinese medicines. If these trends continue ,the wild tiger may evolve from being an endangered species to becoming an extinct species in our lifetime with less than 3000 surviving across the 13 Asian tiger states where they are a natural part of the landscape. If current trends continue, we could lose them completely in the wild within 3-5 years. A few of the remaining endangered subspecies may survive only in zoos; others will live only in stories, pictures and myths, and cereal boxes, never again to roam the earth. Thus, two million years of finely crafter evolution of one of the most magnificent animals to ever grace this planet will come to an end at the hands of modern man in less than 100 years if drastic measures are not taken with immediate effect. Voted the most beautiful and beloved animal on the planet, tigers are also the 4th most powerful of all the animals alive today. The tiger, now critically endangered, once lived in a vast region of wilderness that extended as far north as Siberia, as far south as the Indonesian island of Bali, as far west as Turkey, and as far east as the Russian and Chinese coasts. From icy cold mountains and forests to steamy, tropical jungles, the tiger has adapted to a variety of terrain. 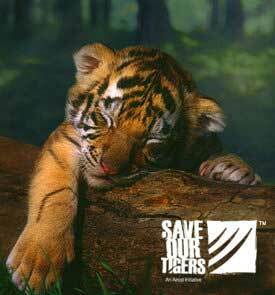 Tigers prefer to live in densely covered land where they can hide in tall grasses, camouflaged by their dark stripes. They are also solitary animals for the most part. Young tigers live with their mother until they are two or three years old -- old enough to fend for themselves and to find territories of their own which can range from 10 to 600 square miles. Largest of all cats, tigers are formidable predators. With razor sharp claws, long teeth, and powerful jaws and legs, tigers can bring down animals far heavier than themselves, including buffalo, deer and wild boar. The tiger's speed and refined hunting skills also capture feasts of small prey, contributing to the 40 to 100 pounds (18 to 45 kg) of meat that tigers can eat in a day. All tigers are striped. Like human faces, each tiger's markings are unique. 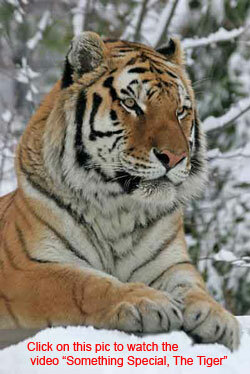 The large, male Siberian tiger can grow to 13 feet (4 meters) in length and weigh 700 pounds (317 kg). Their long tails help them keep their balance through fast running turns. Their tails are also used to communicate with other tigers. 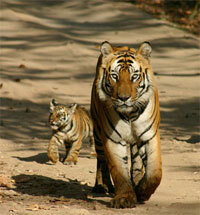 Since 1900, the endangered tiger's habitat and numbers have been reduced by up to 95 per cent. Poachers continue to poison waterholes or set steel wire snares to kill tigers and tiger prey, selling their skins and body parts for use in traditional Chinese medicine. At this point in time, tigers face their greatest peril and battle for survival, with poaching, encroachment of territory and relentless demand for their body parts in traditional medicines and cultural superstitions being the main reasons. Despite 20 years of international conservation efforts, we are losing ground to save this most magnificent of all animals. It is up to us to say ENOUGH! 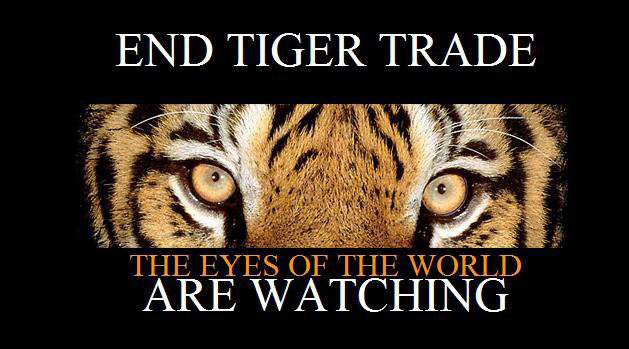 To create awareness and to become a voice for these and all the other magnificent animals on this planet who face extinction in the face of human greed, cruelty and ignorance. Will you join me in being a voice for them? 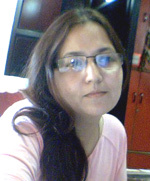 This page is dedicated to the memory of Shehla Masood, the Tigress of Bhopal, tragically assassinated on 16 August 2011.